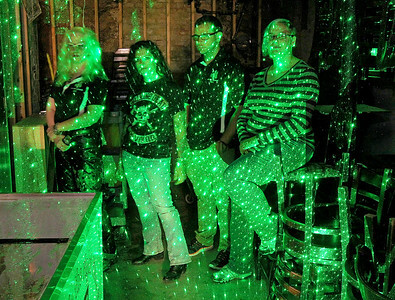 Candace H. Johnson-For Shaw Media Paranormal investigators Liz Nygard, Bekka Lieder, Nick Sarlo and Alexi Ragans-Stauffer, with Shadow Hunters project a laser grid onto the wall to see shadows as they stand in the store room of the basement under the bar at The Lodge of Antioch, a Northwoods Pub & Eatery, on Main Street. Candace H. Johnson-For Shaw Media Paranormal investigators Bekka Lieder and Nick Sarlo, with Shadow Hunters, look for spirits in the basement at The Lodge of Antioch, a Northwoods Pub & Eatery, on Main Street. 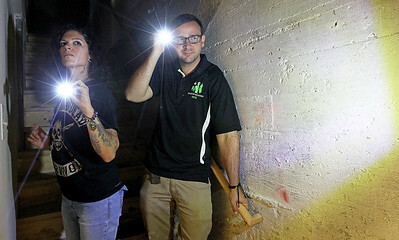 Candace H. Johnson-For Shaw Media Shadow Hunters Alexi Ragans-Stauffer, Nick Sarlo, and Bekka Lieder stand next to Liz Nygard as she looks at a spirit box in the staircase going down to the basement to see if any spirits are present at The Lodge of Antioch, a Northwoods Pub & Eatery, on Main Street. 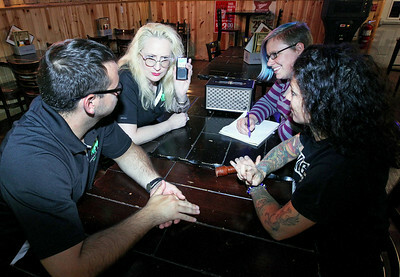 Candace H. Johnson-For Shaw Media Shadow Hunters Liz Nygard (second from left) holds a spirit box as Nick Sarlo, Alexi Ragans-Stauffer, and Bekka Lieder, sit beside her to listen to the spirits talking at The Lodge of Antioch, a Northwoods Pub & Eatery, on Main Street. The spirit box is a device where spirits can communicate with the living. 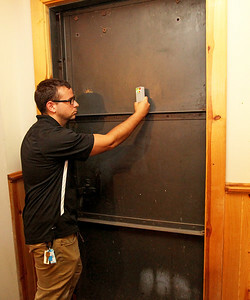 Candace H. Johnson-For Shaw Media Nick Sarlo, Shadow Hunters lead investigator, uses an EMF detector on a metal door to detect if spirits are present on the main floor of The Lodge of Antioch, a Northwoods Pub & Eatery, on Main Street. The metal door used to be in the basement to keep the police out of certain rooms where there were illegal activities. Candace H. Johnson-For Shaw Media Shadow Hunters Liz Nygard, a paranormal investigator, wears pietersite from Cuba to protect her while on location looking for spirits at The Lodge of Antioch, a Northwoods Pub & Eatery, on Main Street. 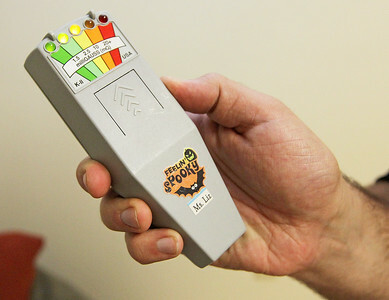 Candace H. Johnson-For Shaw Media Nick Sarlo, lead investigator with Shadow Hunters, holds an EMF detector to detect spirits in the basement of The Lodge of Antioch, a Northwoods Pub & Eatery, on Main Street. If the yellow or red light is on, spirits are present. 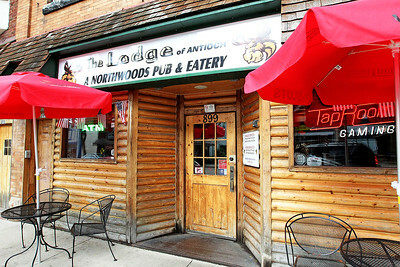 Candace H. Johnson-For Shaw Media The Lodge of Antioch, a Northwoods Pub & Eatery, on Main Street. Down in the basement are spirits of bar patrons who have haunted the place for years. Candace H. Johnson-For Shaw Media Shadow Hunters Nick Sarlo, lead investigator, uses a temperature gage on Alexi Ragans-Stauffer, EVP expert, to see if any spirits have attached themselves to her in the basement at The Lodge of Antioch, a Northwoods Pub & Eatery, on Main Street. If the spirits had connected with Alexi, her temperature would start to drop. Shadow Hunters Liz Nygard, a paranormal investigator, wears pietersite from Cuba to protect her while on location looking for spirits at The Lodge of Antioch, a Northwoods Pub & Eatery, on Main Street.